Describe how data powers digital advertising. Identify the differences between first-, second-, and third-party data. Our customers’ customers as consumers. Take the Audience Studio Basics module. Get familiar with some basic terms for data sharing that we use throughout this module. In our super-connected world, data is the driving force behind great advertising. Consider this: Today’s consumers are always online and connected to a device or three. Or five. They get all kinds of messages from all kinds of businesses, and there’s only so much they can read, watch, and listen to. This means businesses have to learn more about their consumers so they can create more personalized experiences that attract their attention. You don’t have to be a math whiz to make this happen. So what’s the key to this equation? Data. The kind of data that reveals all kinds of details about consumer preferences and behavior. This is why data is rapidly becoming the new currency for businesses in today’s digital advertising world. Purchase data—what consumers shop for or buy. Behavioral data—what consumers browse, read, or watch online. Demographic data—who consumers are, including their gender, age, and family size. Interest data—what topics consumers are passionate about, like hiking or camping. Advertising and marketing—so businesses know what kinds of content attract the attention of consumers. Online shopping—so businesses know what kinds of products and services consumers are looking to buy. Customer service—so businesses know what kinds of service processes and communications are preferred by consumers. Remember Sarah from Audience Studio Basics? She bought cat treats and toys for her cat, Pickles, from Numero Uno, a pet store. She loves the products. However, ever since she made her first purchase 6 months ago, every Numero Uno ad Sarah sees online is for a toy she already bought. 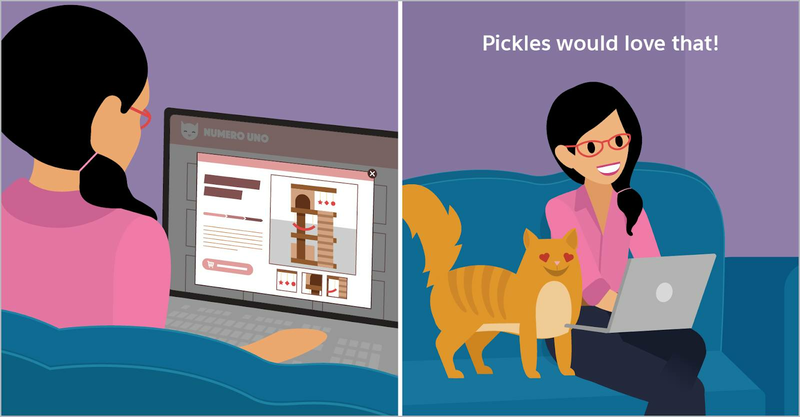 Learns more about Sarah and her shopping behaviors, so it knows that Sarah and Pickles like Treatilicious cat treats and Scrumptious cat food. Sells Sarah a monthly subscription to its Meow Meow box. 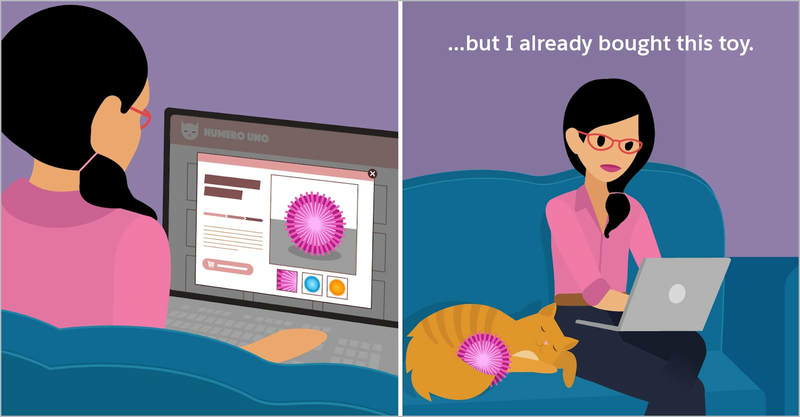 Earns Sarah’s brand loyalty, which helps grow her lifetime value with Numero Uno. Now Sarah’s happier with her shopping experience, Numero Uno sells more products, and Pickles gets more toys and treats. This is all awesome! But the reality is that there’s a sea of data out there, and harnessing all of it to create unique consumer experiences is a big challenge. Before you can use data, you need to know where it comes from. There are three main categories of data to tap into. It’s data you collected yourself from consumers you know. It’s data from a verified source, and can be as precise as first-party data. It’s large scale, which can help you find new consumers and grow your business—but it’s often less precise. Consent is an important best practice for data-driven communications with consumers. Businesses that collect data from consumers should only share that data with another business if the consumer consents. How does this work? Businesses ask consumers for consent, and send that consent to Data Studio. Then Data Studio allows only data that has proper consent to be shared through its platform. Consenting to data sharing is great for consumers because it helps businesses show them ads and content they are more likely to find useful and interesting. The more a business knows about a consumer, the better it can tailor personal experiences for that person. There are two other important things to know about the data in Data Studio. It includes many data types and data sources, but it’s all pseudonymous. This means that instead of being tied to an identifiable person, it’s tied to an identifier that’s a pseudonym that represents but does not identify that person. Also, it’s important to know that although the data in Data Studio can be used to deliver personalized experiences, it is only available in the form of segments. Segments are groups of pseudonymous people who share the same data characteristic. For example, Data Studio may have a segment of people who love cats. There’s a lot of great data out there, so how do businesses get more of it? And how do they get the data that’s most relevant for their consumers? Through sharing data in Data Studio, of course. Help other businesses provide more relevant content for consumers. Drive better marketing response by using data to personalize messages. Reduce advertising costs by using more accurate data. Find more new consumers who are similar to their existing consumers. Ultimately, all of this data sharing leads to the improved experiences that consumers expect in today’s ultraconnected, multidevice world. Now that you know a bit about data and what Data Studio is, let’s talk about how Data Studio helps businesses share data.